World Population Day began in 1987 after public imagination was sparked by the idea that there could be 5 billion people on Earth. Today, we’re well past 7 billion and according to the latest UN projections, headed north of 9 billion by mid-century. But more spectacular than the total number is the composition of world population today. 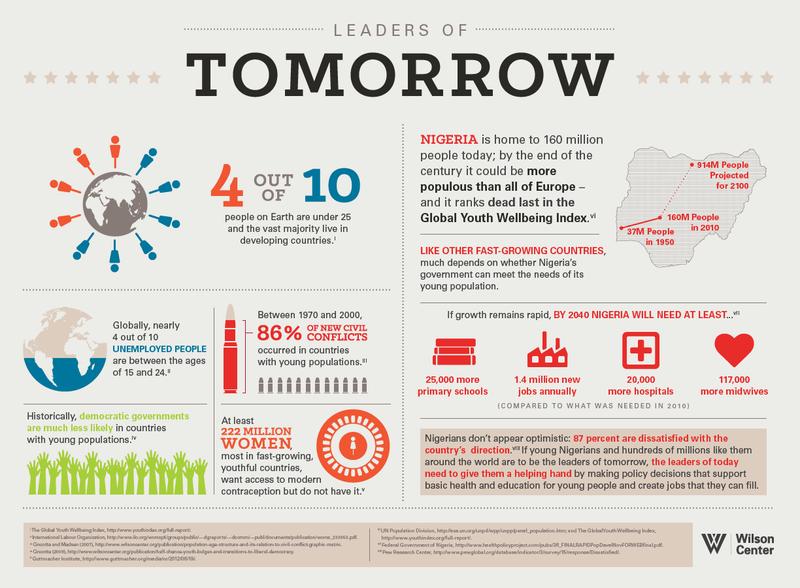 Four out of 10 people around the world are under 25 years old – more than 3 billion people. Together they account for the largest generation in history. That’s why this year the UN is encouraging people to think about ways to invest in the leaders of tomorrow. Many young people are coming of age in societies that are violently fractured. Youth are the primary participants in conflict and half of all forcibly displaced people are children. In many fast-growing countries, where young people make up the highest proportions of society, basic education and health services, not to mention jobs, are sorely lacking, contributing to alienation and stalled transitions to adulthood. Nigeria, where Osotimehin previously served as minister of health, is one of the most dramatic examples of what “investing in youth” really means. Demography allows us to predict with a surprising degree of accuracy what kind of services countries will need to accommodate their young people. The RAPID model, by the Futures Group, uses different fertility projections to estimate a range of needs, including primary schools, teachers, hospitals, midwives, and new jobs needed every year. If growth remains rapid, Nigeria will need more than 25,000 more primary schools, 20,000 more hospitals, 117,000 more midwives, and 1.4 million more new jobs annually by 2040 – and that’s compared to what was needed but not necessarily had in 2010. Investing in young people, especially young girls whose lives are most disrupted by poor access to health care and marginalization, is therefore a critical development objective. But such efforts are rarely easy and often require heroic efforts from local and international actors alike. This World Population Day, let’s pledge to make such success stories more common and work to fulfill every young person’s potential. Sources: Federal Government of Nigeria, Futures Group, The Guardian, International Area Studies Review, UNFPA, UN Population Division.